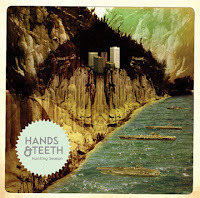 With a critically-acclaimed EP under their belts, Hands & Teeth have generated a lot of buzz for their debut full length album. Hunting Season will be released by the Toronto quinteet on January 17th. The record does not disappoint. It's dripping with delicious melodies and beautiful harmonies. The gorgeous loungy chanteuse turn on "Le Petit Voleur" is absolutely enchanting. The arrangements are gritty and introspective, without ever sounding unpolished. One listen to the guitar at the end of "All That Was" will have you wondering how they could accomplish that. There's a dark rumble on "Sound of Hamilton", that makes it an oddly appropriate theme for an industrial town, but still never makes you feel dirty. In this day and age, no band is completely original. Everyone cribs from those who came before. The originality comes in how the artists takes those influences and synthesizes and augments them. That's what Hands & Teeth do exceptionally well. The album opener, "It's Coming Back", sounds like the wistful lovechild of Broken Social Scene and Ohbijou. "Missing" us a delightful pop number that could easily be mistaken for Jason Collett filling in for a sick member of Sloan. The title track features a female/male back-and-forth that falls somewhere between a Millan/Campbell opus and a rollicking Cervenka/Doe number. As far as debut albums go, one couldn't really hope for much more than what Hands & Teeth give us on Hunting Season. Best tracks: "Parallel States", "Hunting Season"
Periodontal disease is actually a problems of the teeth socket. Periodontal disease leads to gum pain, infection, inflammation, as well as tenderness. If left untreated rampant germs will make periodontal pockets and destroy healthy bones.